Optimise™ Underground Packaged Plant Rooms. Dutypoint are able to offer a wide range of standard and bespoke prefabricated solutions including packaged booster sets with storage tanks, packaged pumping stations and modular equipment skids. When compared to installing multiple separate units, these solutions offer the potential to drastically reduce the amount of onsite installation time for a project. The Dutypoint Optimise packaged plant room provides a cost-effective, safe and efficient solution to plant room space, and for installing water systems underground. By combining industry-leading technologies, Dutypoint can offer a system which overcomes many of the challenges associated with underground plant rooms, with lower overall costs, unique safety features and ease of maintenance. 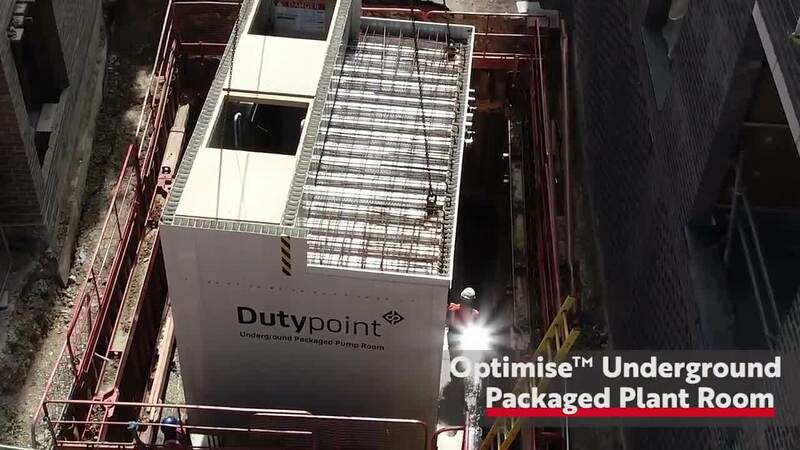 By utilising a pre-fitted concrete shuttering system, the Dutypoint Optimise can be installed in a fraction of the time of a conventional underground chamber. The shuttering system allows the concrete work to be completed in only two pours, vastly reducing overall pour time, reducing the number of entries into the excavation and therefore reducing the number of working hours required to complete the installation.